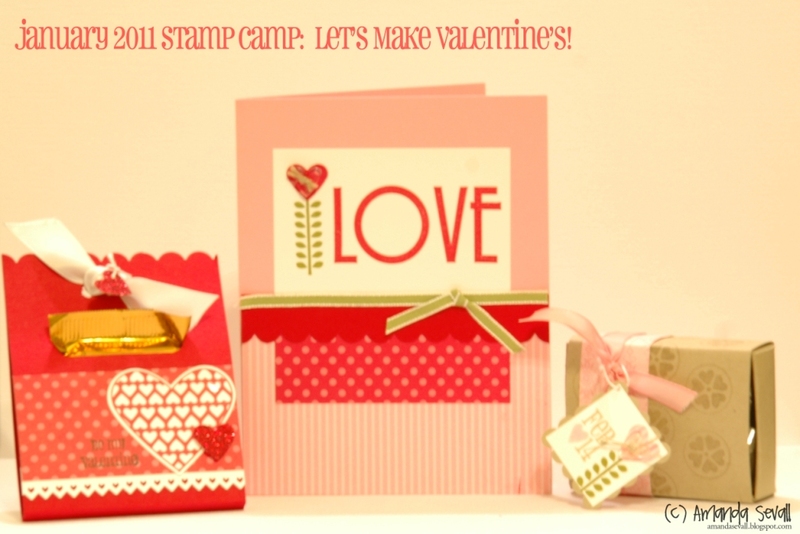 Amanda Sevall Designs: January 2011 Stamp Camp: Let's Make Valentines! Have you thought about Valentine's Day and the homemade goodies you will be making? Here are just a few of the things I have planned, and if you live in the Monterey area you are more than welcome to come. And if you live out of the area you can always participate by mail! Please join me and create these fun cards and candy holders. They are perfect for Valentine's Day gifts and treats for your spouse, family, friends, neighbors and co-workers! All supplies, paper, ribbon and embellishments will be pre-cut, ready to stamp and assemble. Bring your favorite adhesive!!! Date: Sunday, January 9th, 1-3pm, located at my house in Soledad, California. Cost: $10, free to Stamp Club members or if you purchase more than $25 worth of merchandise at the class. Please RSVP by e-mail or phone no later than Saturday, January 8th so I can make sure you have the supplies you need! 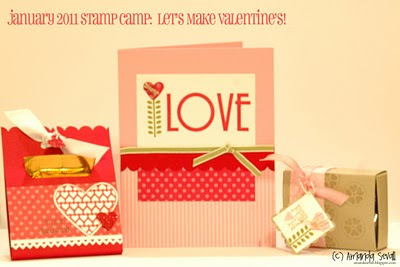 This class uses the cutest bundle package available right now for Valentine's Day from Stampin' Up! I'm in ♥ with it!!! Definitely one of my favorite color combos and stamp sets. It's called Filled With Love and it includes the exclusive Filled With Love Stamp Set (available in wood or clear mount only through this promotion), 12 sheets of double-sided Love Patterns Designer Series Paper in two colors - Pretty in Pink & Real Red - and a free package of Clear Bitty Buttons! Prices for these bundles are shown below and you can order this promotion bundle HERE until January 24th. Once this promotion is gone, the stamp set is no longer available so don't wait too long if you like it!